The large renovated apartment is distinguished by its panoramic views and their privacy. It is located in a very tastefully renovated house in a quiet location, yet central. The well-equipped kitchen makes self-catering easy. Pets are allowed. TV and Internet access. Parking in front of the door. If desired, a garage can be offered. Even without a car to get there by bus and ski bus or train in the surrounding villages. The shops, cafes and inns are all within walking distance. For young people Zell am See is an amusement center, there is a nocturnal bus service at the weekend. Children can play in our garden. There are lovely walks from the house and the entrance to the cross-country ski trail. The house is located in a nice residential area. The bathroom was renovated in 2011 and is characterized spacious and practical, there are in 2 large skylights. Sheets, towels, tea towels, tablecloths, cookware and crockery are provided, as well as a small selection of spices and cleaning products. We have had a lovely weekend, the apartment is completely as expected. The town is perfect for us and the ski area is vast. Good central location with beautiful views. 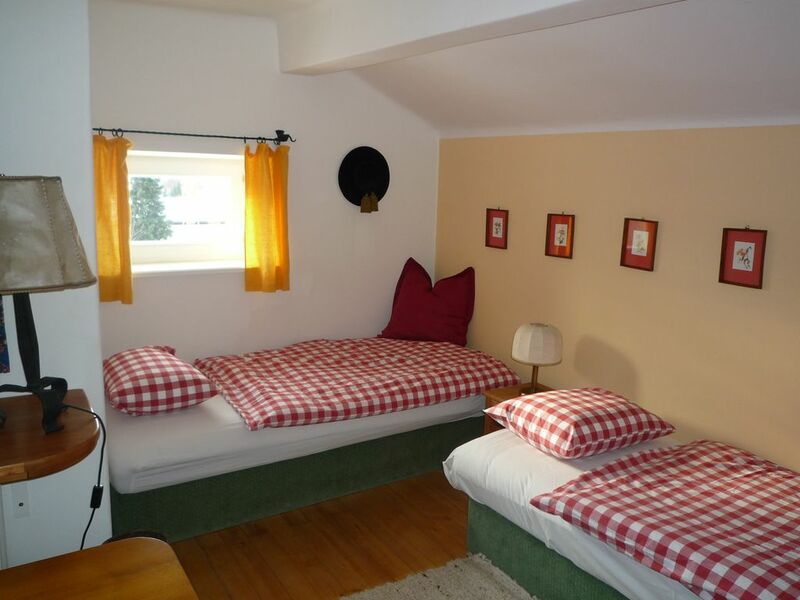 We spent two weeks at this apartment in Saalfenden,we are a family of 4, 2 adults, 2 children, we chose it because it had a central location for all the sights that we wanted to see and for it's stunning views. The views are stunning both front and rear and the bath has windows above it so it feels like you are bathing under the sky. Any visitor to this property who wants to explore the area is recommended by us to search out the Salzburger land card available through the local tourism offices for 6 or 12 days and gave us acces to cable cars, museums, castles, waterfalls, 45 swimming pools, 2 spas, panoramic roads, wildlife parks and a day pass to the salzburh attractions. We were made to feel very welcome and we had no problems during our stay. Would highly recommend. The apartment is located in a quiet area but central to shops, cafes and pubs, cultural center, golf course, swimming pool, lake, hiking trails, summer toboggan run and ski slopes, cross-country skiing, ice skating. Magnificent mountain panoramic views, large balcony and garden. the apartment is spacious (80 m2), consists of 3 bedrooms, hall, kitchen and new bathroom with 2 large skylights. The apartment is on the second Floor and attic thus a very tastefully renovated house that stands in 1200 m2 and the guests is also a large garden available next to a private balcony. Pets are allowed. Happy to assist you the owner of the house more or make-to-order breakfast. The place Saalfelden with its surroundings offer the best leisure activities both in winter and in summer. The annual Jazz Festival in late August of Saalfelden is known throughout Europe. Golf: For golfers there are in the immediate area 3 golf courses, Urslautal, Brandlhof and Zell am See and Kitzbühel is 50 km away, the exact descriptions they can elicit the Internet under the particular golf course name. Ski: The ski area is characterized by its snow and the wide range. Perfectly groomed ski slopes, ski touring opportunities, fun parks for snowboarders as well as an extensive trail offer besides toboggan runs spoil the tourists here. In addition to many nice mountain huts to stop, there are also outdoor bars and upscale modern mountain restaurants. Saalfelden Leogang area is connected with Saalbach / Hinterglemm. The Kitzsteinhorn glacier and offers with its many lifts even in summer the possibility for skiing or snowboarding.